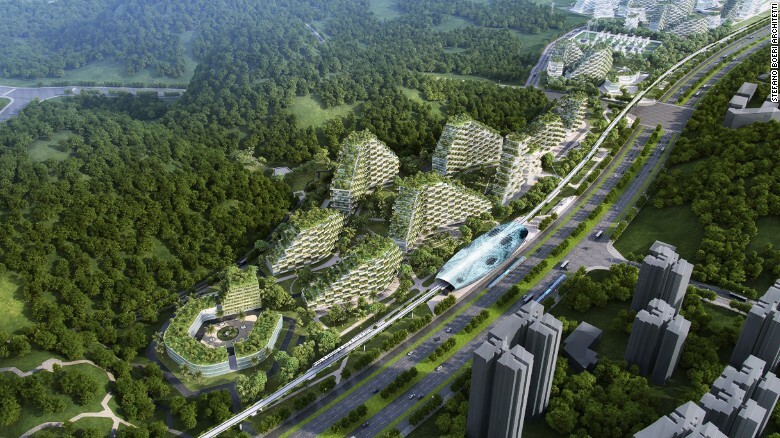 China to build world's first "Forest City"
News: China to build world's first "Forest City"
China has just unveiled plans for Liuzhou Forest City, a colossal metropolis that will tackle pollution with one million plants and 40,000 trees. The project has been designed by the Italian firm Stefano Boeri Architetti and will be built in southern China. The community will be home to 30,000 people once it is completed in 2020. This innovative solution consists of building properties, offices, hotels, hospitals and schools that will be entirely covered by a wide range of shrubs and floral plants, along with 40,000 trees. Occupying 432 acres, the Liuzhou Forest City will be roughly half the size of New York´s Central Park. The trees and shrubs will breathe in fine dust from the air, soaking up pollutants from the toxic environment, thus producing approximately 900 tons of oxygen annually. This should also help decrease the average air temperature, create noise barriers and improve the biodiversity of living species. In addition, there are plans to include geothermal and solar energy resources, so the city runs on a self-sustainable power source.